The drive around the fabulous Gorges du Verdon in the Regional Natural Park of the Verdon in Provence, France, is not for the faint-hearted. It’s a journey with mouth-dropping views and gaping crevices that plunge 2,300 feet deep down toward the slowly moving river below. It’s a drive of hairpin bends with the odd stopping place. Quite frankly, it's worth every nail-biting moment. If you can, avoid the summer months of late June, July, and August when a long line of vehicles moves at a snail's pace. If you are there at that time, try to do the drive very early in the morning. If you’re early enough, you’ll be rewarded with a sunrise that will make you feel you’re at the birth of the world. 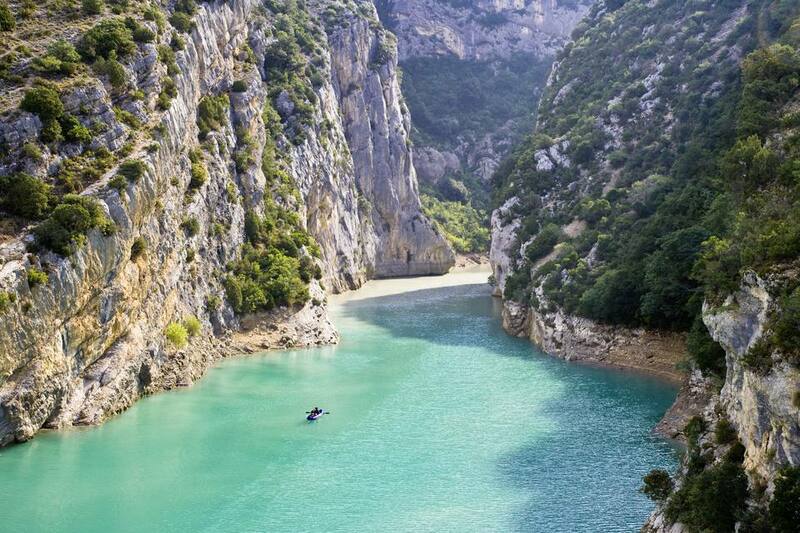 The Gorges du Verdon road trip can be done in a day if you're staying in Nice, Cannes, or Antibes. But it's a long day (two hours, 30 minutes from Nice; two hours, 15 minutes from Antibes; and two hours, 20 minutes from Cannes. This drive starts at Trigance, a little hilltop village dominated by a great castle hotel, the Chateau de Trigance. Book a room here for the ambiance, the rooms, and a great meal. From the village, take the D90 south, signposted rive gauche Gorges du Verdon and Aigunes. When you get to the D71, turn right toward the Balcons de la Mescla where there’s a stopping place. The road was built specifically to give the best views, both of the canyon and the blue river way down in the gorge. The rough hillsides change shape and color as you drive; sometimes bare, at other times covered in pine trees. The gorge is 15 miles long with drops straight down. At Pont de l’Artuby the brave (or perhaps the completely bonkers) try their hand at bungee jumping; at Falaise des Cavaliers you can walk out to an overlook for another precipitous view, while rock climbers disappear over the edge with an alarming speed at Cirque de Vaumale. After that, the road continues to twist and turn, but the countryside becomes friendlier. Then you start descending and come across a delightful chateau, its round towers topped with brightly colored tiles. You’re at Aiguines, a good stop overlooking the gorges and the Lac de Ste. Croix. It’s a pretty village with a long main street with cafes and restaurants for lunch, a few hotels, and a good picnic spot in a small park near the castle. The parking is easy. For another lunch option take the winding country road to les Salles-sur-Verdon, an artificial village created when the dam for Lac de Ste. Croix was built in the early 1970s. Many of the residents came from the former village, which was destroyed to make way for the dam and the new lake. The village is a peaceful place, full of vacation homes and with hotels and bed-and-breakfast inns and a helpful (and English-speaking) tourist office in the center of the village. People come here for the water sports on the lake, so it’s pretty relaxed. Have lunch on the little terrace of La Plancha. Local produce like organic pork and lamb and locally caught fresh fish are grilled over a wood fire and arrive at the table with homemade gratin dauphinois or fries. There are also tempting daily dishes like stuffed Provencal tomatoes. If you lunch at Les Salles, head back up north on the D957, which runs beside the lake, and follow the signs to Moustiers-Sainte Marie, turning left onto the D952 at St. Pierre. Park at the outskirts of the village; in summer it is overrun with visitors. It’s a beautiful hilltop village with a stream that runs down between two cliffs. Above it hangs a huge star, originally put there by a returning knight from the Crusades. The village has two claims to fame: its pottery and its chapel of Notre-Dame de Beauvoir, which sits above the village and has a great view. The pottery is hand-made, hand-painted, and signed by the manufacturer for authenticity. Try the shop Lallier on the main street for an authentic selection. The company has existed since 1946 and is still family-owned and -run. From here the drive takes you back down the D952 to the northern edge of the canyon and another great drive. The road is slightly bigger than the southern rim road but no less torturous for that. For the most nail-biting part, drive the Route des Cretes. Stop first at La Paulud-sur-Verdon, then continue down the small road. This is for hardy drivers only; at times you could drive straight off into the abyss down a 2,625-foot drop to the river below. (The road is closed between Nov. 1 and April 15 each year.) But the views are extraordinary, and you can stop at different places if there aren’t too many cars. Two outstanding stops are the Chalet de la Maline and the Belvedere du Tilleul. You emerge, triumphant if a little shaken, according to your driving skills, back on the road at La-Palud. Go on eastward and stop at the Auberge du Point Sublime (open April to October) right on the edge of the gorge. In the same family since 1946, it’s a wonderful spot and you’ll get good local cooking here. Now you can either continue on to Castellane, Digne-les-Bains, and Sisteron or turn south at Point du Soleils on the D955 to Comps-sur–Artuby and the Var villages around Draguignan.